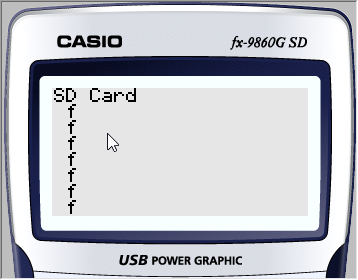 I'm working on a project which involves loading files from either Storage Memory (\\fls0\) or an SD Card (\\crd0\). So far, my reasoning leads me to think that FONTCHARACTER (which according to VSCode, is an unsigned short) is not interchangable to a simple unsigned char pointer the Print method uses. I've tried to see if that's the case by trying to implement a quick and dirty FONTCHARACTER to char* converter, which to say the least... it doesn't work. It has exactly the same output. 'f', 'f', 'f' etc. I've tried to look all across the forum (and the internet) for a way to print filenames from Bfile_FindWhatever, but it came out dry. The primary goal by the end is to have something looking similar to the built-in memory management software. If you could, it be nice if you posted your entire code, it would be much easier to figure out the problem. Also, I suggest using while do instead of do while, as you may actually read out of the string. This is wrong in fc2str. 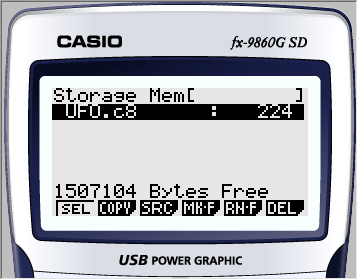 This add-in became a good reference for C.Basic's file process. I believe this program will be of your help.